The Walt Disney World Resort has announced a new round of discounts for Disney World Resort Hotels for Summer 2010. The newest discounts are for vacation stays in a Walt Disney World Resort Hotel from May 2nd through August 14th, 2010. The discounts are available to the general public and are discounts off of the regular rack rate for Disney Resort hotel rooms. No package purchase is necessary, but packages can be purchased including the discounted rooms. If you choose to stay at a Disney Value Resort you can receive 15% off normal summer rates. 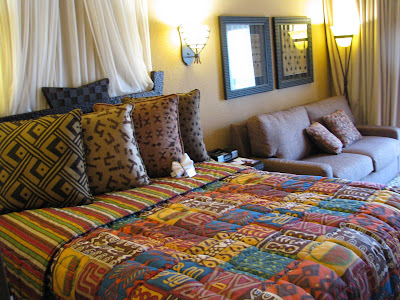 The discounted cost for a standard room will cost between $90 and $114 depending upon the actual night. Those choosing to stay at a Disney Moderate Resort can receive 20% off normal summer rates. The discounted cost for a standard room will cost between $140 and $164 depending upon the actual night. The savings at a Disney Deluxe Resort is even higher at 25% off normal summer rates. The discounted cost for a standard room will cost between $180 and $240 depending upon the actual night at Disney's Animal Kingdom Lodge or Disney's Wilderness Lodge. The biggest discounts are available for the Disney Deluxe Villas with savings of 30% off normal summer rates. The discounted cost for a standard room will cost between $180 and $240 depending upon the actual night at $207 and $231 at Disney's Saratoga Springs Resort or Old Key West Resort in a Studio Room. Make reservations before August 14th to receive these discounted resort rates. Book your stay online now or call Disney at (407) 939-7515 or your Travel Agent and ask for booking code TD7. 0 comments to "Disney World Resort Discounts Up To 30% Off For Summer 2010"